In the savage FedCom Civil War that rocked the Lyran Alliance and the Federated Commonwealth for the past five years, new machines of war have been rapidly tested and put in the field to help turn the tide of battle in each faction’s favor.The Clans and other House have also been busy, as the internal and external conflicts drive the rapid deployment of new military hardware. 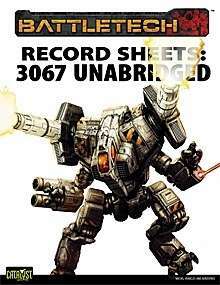 BattleTech: Record Sheets: 3067 Unabridged offers players the record sheets for all BattleMechs, Combat Vehicles and aerospace fighters detailed in BattleTech: Technical Readout: 3067. Additionally, numerous never-before-seen variants are included, mounting the latest Standard and Advanced Rules weapons and technology from Total Warfare and Tactical Operations. I have noticed that the Mech, the Scylla, is missing armor circles in all areas except the center torso (front), and head. Otherwise it looks good. This title was added to our catalog on November 26, 2012.